I have two hedgehogs, Theodore and Thaddeus. Thaddeus just joined our family on the 14th. I got a message from an old high school friend on Facebook saying that another friend from high school's girlfriend (got that) works at Petsmart in Houston and some asshat abandoned a hedgie there. She immediately thought of me and was curious if I wanted to take it in. I had an extra cage, wheel, liners, hedgie bags, everything, so I very well couldn't turn it away. I wasn't sure if it was a male or female, how old it was, or even whether it was healthy or not, but I just knew I had to take him. My partner was wary at first, for the simple fact that he was worried if it turned out to be sick and eventually died in my care that it would really hurt me, but I explained to him that yes, it would hurt me, but it would hurt me even more to know that I didn't give it a chance. So, early Thursday morning they brought me a cardboard box with a tiny little hedgie inside. I was expecting an older, unsocialized, neglected hedgie, but it turns out he was a little, sweet as pie, neglected hedgie! I can't understand why anyone would want to just abandon this precious little guy! I think he is around 4-6 months old and from what I can tell so far I think he is a dark eyed cinnicot. I'm a little curious because he has two solid white stripes on both of his sides. Possibly a little pinto? I'm not sure, but either way he is absolutely precious. Aside from the fact that he is really underweight, has severely dry skin, and had bedding (or something) MATTED into his quills he is doing wonderfully! He hasn't been to the vet yet, but he will be soon. :) He is already eating well and enjoying his new WHEEL! I don't think he had ever seen a wheel in his short little life. He is very, very sweet and enjoys being snuggled. Anyway, here's a few photos I snapped of the two of them today. 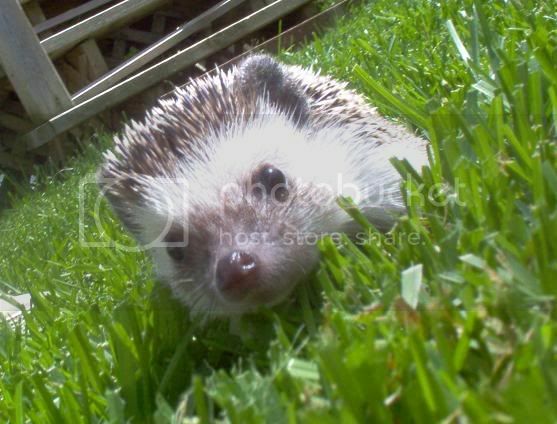 If you're interested in seeing all my hedgehogs pictures here's where you can find them. 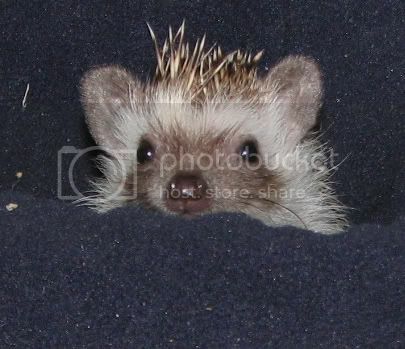 - Quillson Wilson, my first hedgehog who passed from WHS in 2005. I miss him every day. - Theodore Butters. He's not the most social hedgie, but I love him regardless. Happiness is definitely a warm hedgie. Crossposted to hedgehogs, so sorry if you see this twice. Took the kids out today for a lil' fun in the sun. They seemed to enjoy the smells, but of course hunted for shelter.. OMG SUN! Lorelei is the albino, Tiki is the darker one. 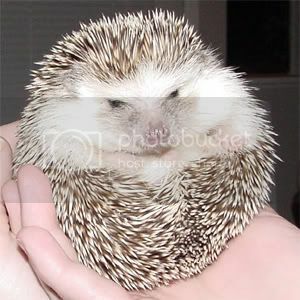 I rescued a hedgehog out of a sour situation and I need a home for it, I cannot keep it as my own for parental reasons. He is very sweet and I want to see him go to a good home. If you are interested please email me at walkinthegrass@gmail.com . I would prefer he go to an experienced owner. I haven't decided on her color yet. Some of her bands are a light ash and others are a light blonde.. and about 5% solid white. My camera phone didn't pick up her colors very accurately. I'll eventually take a picture with my digicam when the sound of my blinking doesn't result in her curling up into a ball. I rescued her from a very shady exotic pet store when I was out of town this past weekend. She was living in cedar bedding. The pet store employee told me that someone just left her in a box on the counter. She had been in the store for almost 3 months, and no one had touched her (except with a glove to change bedding) since then. I wanted to hold her, but the employee said I probably didn't want to because she was so mean (no, jerk, she was scared). They were selling her for $80. I talked them down to $40. I couldn't leave her there. I have had hedgehogs for the past 8 years. My other one is a dark grey named Xeke :o) I posted pictures of him awhile back. Since Friday (when I first met her), she will now let me hold her. We are making excellent progress. She still gets scared if I even breathe wrong, but we are getting there :o) Lots of love and lots of patience. How do i make my hedgehog love me? Ive had him for over a year, and he still stabs me and snorts and huffs and puffs, i try handling him so much, i use gloves and leave him on my lap but he refuses to be nice, just stays in a ball and wont move. I don't wanna have to use gloves! I wanna hold him and love him without him eating me! Oh, and does anyone know how to make him stop pooing everywhere? I wish he could use a litter box, so it would be easy to clean, but he walks through it and gets poo everywhere. I have to clean the wheel so much...He's albino too, so you see everything, and its so gross I have to bath him so much. Oh Dr. Squiggles! Why wont you love me?! Xeke has always been on the bigger side, but lately he has developed fatty arm pits and has trouble rolling into a ball completely. He is already on ultra-diet hedgehog food (very high protein, very low fat), and he receives a few mealworms a few times a week.. He IS an insectivore after all :o) The weight problem started when I got him a bucket wheel. Every other wheel on the market just isn't suitable for a heavier, small animal. He would wear them out in about 6 months. The bucket wheel works great except he can't get traction on the wheel. My boyfriend and I are currently working on something to help with this problem. Until we get a suitable solution, Xeke has daily swimming lessons. Well, not lessons, really, since the boy knows how.. 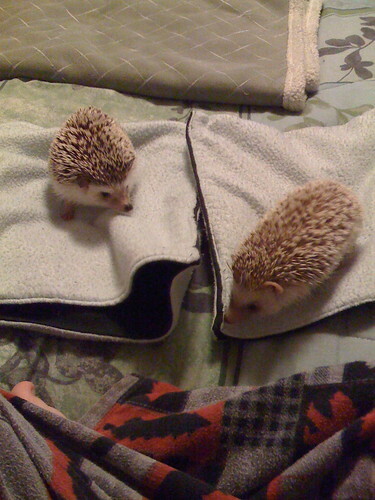 I figure that since swimming is the best exercise for humans, why not hedgehogs? I hope it works, though. He turns 4 on Jan 27th, and I want him to live a long, healthy life. My hedgehog is INFESTED with these bugs, they look like red fleas or ticks. I used this flea shampoo on him and i got most of them off, but i was wondering. Is it safe to put pet foam on him? Its for flease and ticks. Is the oil safe? I have all this stuff at home. Should i change the wood chips in his cage?! This is Spike :) I know, not horribly original, but at least we didn't name him 'Sonic'! We've only had him for about a week, but we're already pretty attached. He came from a friend who'd had him for a little over a year. I just gave Bloo a bath, then took him outside so he could run around/dry off. then he decided to get dirty by self annointing. whatever! We're starting to put a pool up at my house and we had to lay down a bunch of sand for it and since its been a nice, hot day, I decided to let my hedgehog roam around in the sand for a little bit. I took some pictures and thought I'd share them with you. Oh yeah, has anyone seen the Altoids Sours commercial with the hedgehog? Its great. I took some more pictures of Skeezix at his "party" yesterday. 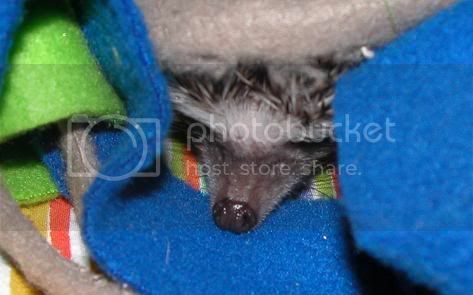 Here are some pictures of my hedgehog, Skeezix.